Bradford O’Donnell, McGowen, J O’Brien, O’Connor, Scannell, Doyle (c), Payne, Knight-Percival, Wood, L O’Brien, Ball (Bruenker 74). Charlton Steer, Solly, Bauer, Pearce (c), Page, Cullen, Reeves (Lapslie 65), Aribo, Ward (Vetokele 75), Taylor, Grant (Sarr 90). 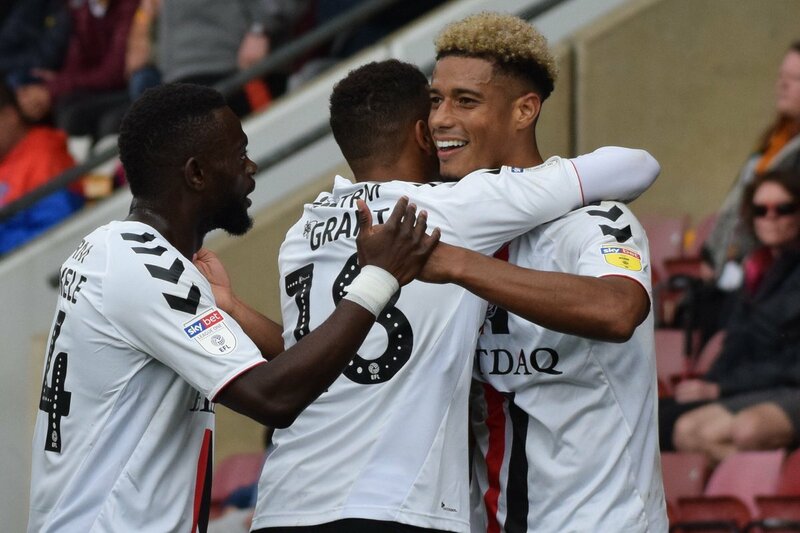 Three wins on the spin for the mighty Addicks as the striking duo of Lyle Taylor and Karlan Grant continued to build on their fine start to the season. Grant opened soon after kick off, cutting in from the left and finishing with aplomb after a great ball by Josh Cullen. With nine minutes to go, Taylor wrapped up the points when he similarly checked back from the left and rifled into the top corner. Charlton up to 7th but only 1 point off 3rd. Bowyer: "“In the first half, we were excellent, we moved the ball well and I think we should have been two or three up at half-time, but we need to be more ruthless and put teams to bed. In the second half, we made it tough on ourselves, we gave the ball back to them too easily at times and they put us under a bit of pressure without creating any chances." “They’re both [Grant and Taylor] looking for each other now and I said after the Accrington game that things would change. What happened on that day wasn’t good enough because you have to work as a team, but they’re definitely doing that now and playing as a partnership. Ward has come in as that clever one behind them and they just keep scoring goals – it’s what they do – and I see it every day. When Lyle stuck that in the top corner, it didn’t surprise me because I see him do it every day in training. @RedChaser : The line up was a 4-4-2 diamond, Steer in goal, back four, Solly Bauer, Pearce, Page, Cullen at the base, Ward at the tip, Reeves right and Aribo left. Grant and Taylor up front. We kicked off and played keep ball for a few minutes until the Bantams attacked Page with ease and from a goal line cross Steer made a wonder point blank save to prevent a very early reverse. Cullen impressed straight away, demanding the ball to set things up and when we didn't have possession he was snapping into tackles to win it back. You can always tell a player from a higher level the way they appear to have more time to pick a pass. The reason being that they know where the ball will be going before they receive it more commonly known as vision and Josh Cullen had it in abundance today. After about 10 mins 3 mins he picked the ball up from a good Page tackle near the halfway line and picked out Grant on the left who cut in and unleashed an unstoppable right footer across the keeper into the net 1-0 to the Londoners. The rest of the half was fairly even, Steer was rarely troubled, Pearce and Bauer dominated their strikers and the home fans were rather subdued as we got to the break looking comfortable for three points. As always a second goal for some breathing space is crucial but new City Manager and Palarse reject, beefed up, David Hopkins had other ideas having no doubt read the riot act. The home fans suddenly found their voice at the start of the second half as they pinned us back and corner after corner came in. Had this been blow football I'm sure they would have cheated by sucking the ball into the net. The natives were constantly trying to influence the ref with penalty appeals and demands for our players to be booked / sent off. The defence was being tested to the limit but Bauer and Pearce were man mountains receiving good support from the full backs and Cullen. However fresh legs were needed and none better than Lapslie's for Reeves. Having weathered the onslaught and despite several yellow cards being waved we managed to get a foothold back in the game and some nice interchange play down our left with Grant passing to Taylor who cut in and buried a fierce shot for 2-0 to the relieved Londoners, game over. Nice little cameo from Igor and sensible use of Sarr On 85 mins (plus 5 mins injury time) to go with three CBs and withdraw Grant. Ward looked a bit ring rusty but added that experience and little bit of nastiness that we've lacked previously, more to come from him for sure. We came we saw we conquered and a final word for our fans who were in fine voice throughout with some decent new songs which I'm sure I'll get to learn the words of, eventually.